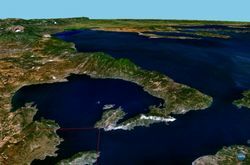 Mount Pelion (also spelt Pelio or Pelium; Greek, Modern: Πήλιο, Ancient/Katharevousa: Πήλιον) forms a hook-like peninsula between the Pagasetic Gulf and the Aegean Sea. South East Pelion lies at the Aegean Sea, it's facing Skiathos island. The mountains in South Pelion are less forested compared to North Pelion. Pelion is a tourist attraction throughout the year: the mountain includes trails and sidewalks for walking within small and large beaches with sand or pebbles. Located near the city of Volos, in the prefecture of Magnesia. South East Pelion is the area of Pelion which is in a distance from Volos. There are frequently buses from Volos to most of the villages in that area. KTEL Volou have the only way to get around operating from from Volos Interurban Bus Terminal ("Yperastiko KTEL") ( ). Walk along the recognized hiking routes. There is a good variety of beaches on Pelion. Beaches on the Aegean sea are huge sandy beaches with deep waters and sometimes big waves. The most lively nightlife can found in Platanias. This page was last edited on 26 September 2012, at 07:19.